Today’s anthem was sung by a quartet of voices rather than the choir – just for a change. The piece started life as an 18th century flute tune before I set to work on it! I don’t think the congregation had ever heard a harpsichord effect, on the Clavinova before – I thought it was remarkably effective for accompanying four singers in a tune from that era. So, what we had was an Anglo-Scottish flute tune called ‘The Bonny Scot’, first published in London in the early 1700s, turned into a sacred anthem by an Englishwoman for performance in Scotland. Work that one out! Someone asked me afterwards what the piece was. I summarised by explaining that the soprano sang the original flute tune, the alto and baritones sang my accompaniment, and the words were taken straight from another hymn with a suitable meter! So, the Musica Scotica conference is behind us. It was declared a resounding success. 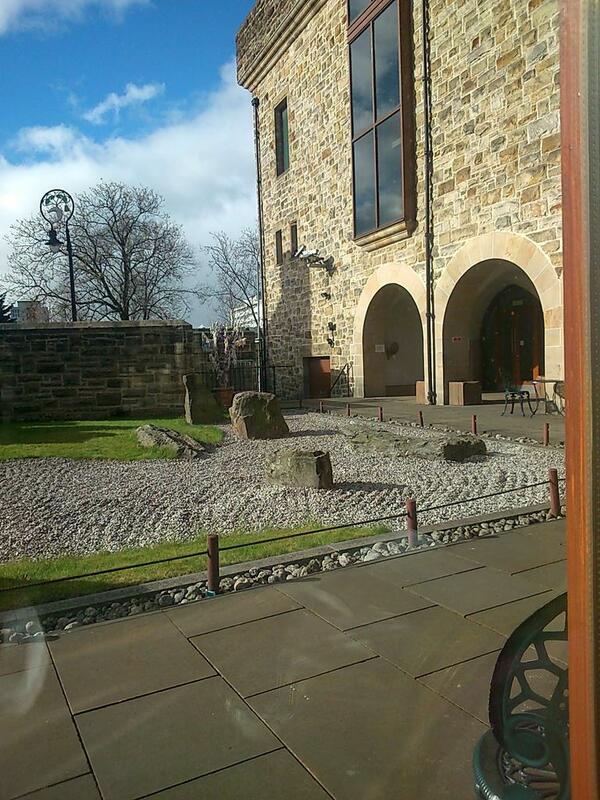 The St Mungo Museum was a delightful venue – I’m sharing some pictures of the room we met in, and the view out in the courtyard. 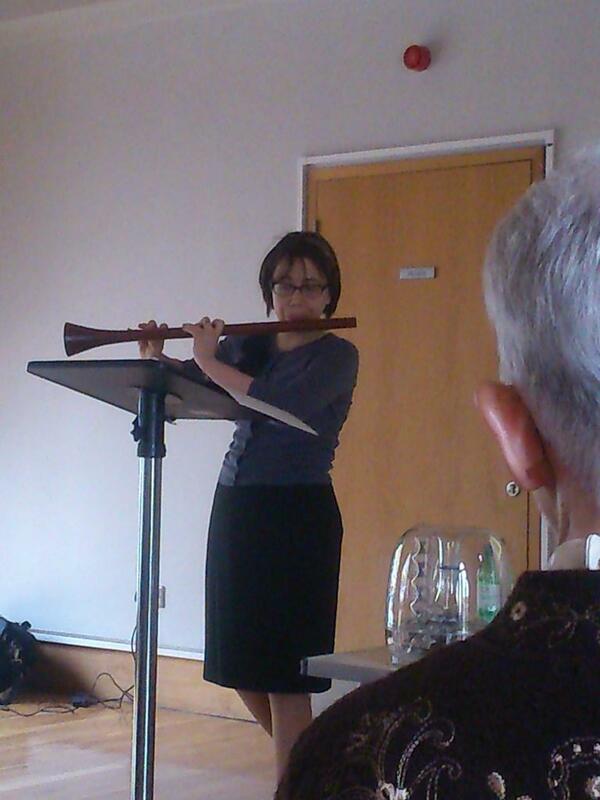 Besides a host of interesting papers, there was the unveiling of Elizabeth Ford’s reproduction Crathes flute – she got an instrument maker to reconstruct a flute the likes of which has never been seen anywhere else but on the ceiling at Crathes, and then played it to us. We heard John Maxwell Geddes talk about his compositional inspirations, and went to St Bride’s Episcopal Church to hear his latest commission. And we heard Pete Stewart talking about early representations and references to bagpipes. Yes, he played several sets of bagpipes, too. 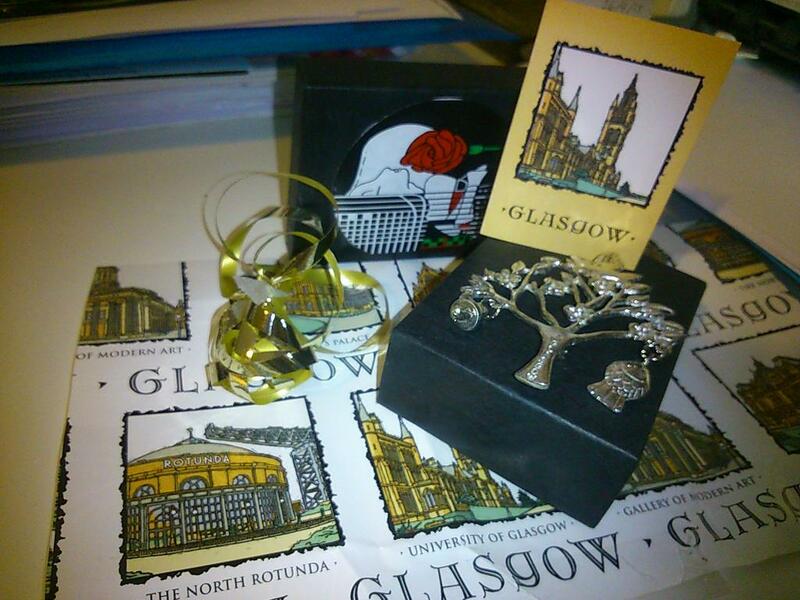 I certainly didn’t expect to be presented with a gorgeous Glasgow brooch at the end of the conference, but it is so lovely that I thought I’d share it here too – a final surprise for me! Sycophants and Control-Freaks? That’s our Contemporary Reaction! In connection with our Bass Culture research project, I’ve just blogged about fiddlers Niel and Nathaniel Gow and their attempts to control Scottish fiddle music in the early nineteenth century. You can read my blogpost here. Do You Research Scottish Music? Here’s the Musica Scotica CFP! Papers, 20 minutes in length, are invited on any aspect of Scottish music. Topics presented in previous years have included chant, Gaelic song, fiddle and bagpipe music, manuscript sources, music publishing, the Scottish diaspora, opera performance, cultural organisations, music education, sectarianism, George Thomson and Haydn, Marjory Kennedy-Fraser, Learmont Drysdale, Hamish MacCunn, James MacMillan and Sally Beamish. 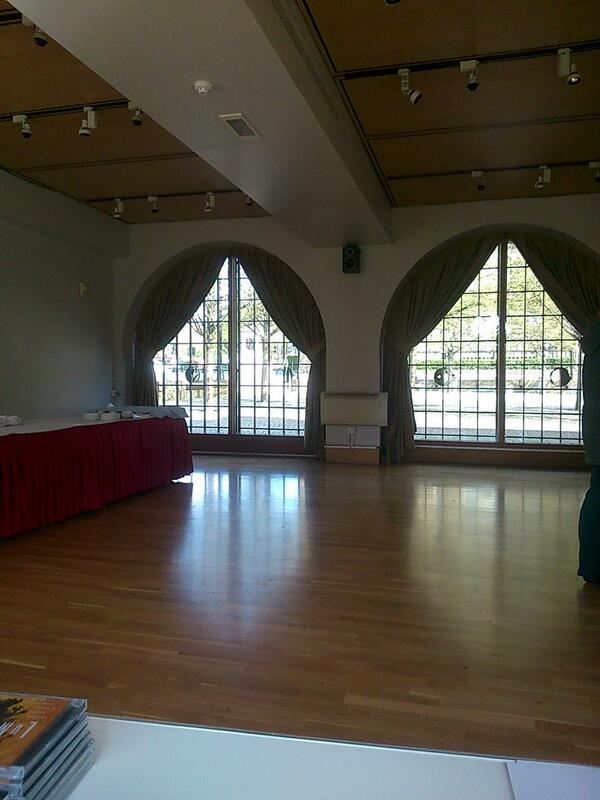 We are interested in papers that in some way relate to the history of the McEwen Chamber Music concerts. Papers may focus either on specific pieces that were commissioned, or on the work more generally of composers who have befitted from the McEwen Bequest over the years. Most importantly, we are interested in papers that aim to stimulate interest in and discussion around contemporary music in Scotland. You will be notified by mid-March 2015 if your abstract has been accepted. A poster session may be included; delegates are invited to indicate whether they would be interested in availing themselves of this opportunity. 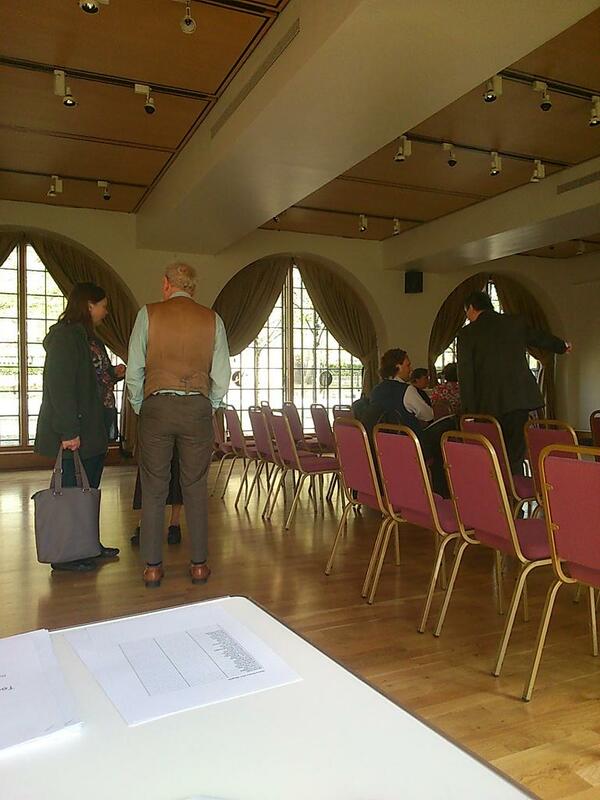 £15 as the default half-day without lunch, for any category of delegate. The registration form will be available in due course on the MusicaScotica website. Musica Scotica will publish papers from this conference along with a selection of papers from previous conferences. I’m enjoying Maud Karpeles’s biography of Cecil Sharp. It’s interesting reading about his folk song collecting, and how he was determined to get folk song back into the school curriculum so that children would get acquainted with their heritage. He also got involved with Morris and folk dancing, and got quite hot under the collar about well-meaning people who were happy to get the dances DANCED, without being too concerned about the niceties of accuracy. By all accounts he was an astonishingly dedicated and hard-working individual. His definition of ‘folk’? Something passed through the oral tradition, perhaps modified as it was transmitted, but certainly not a “national song” published in a book and henceforth preserved in aspic. Something more fluid in form, then. Does it not seem that both Cecil Sharp and Miss Milligan, having collected something that they feared would perish if it weren’t revived, then proceeded to try to pin down and ‘fix’ the very traditions that they were saving? It’s as though each was saying, ‘this is what I consider the purest form of THIS song, THIS dance, and THIS is how it should be from henceforth.’ Indeed, my mother-in-law, a longstanding and loyal member of the RSCDS, later earned a scroll of recognition of her ‘outstanding service and loyalty … maintaining the aims of preserving the standards and traditions of Scottish Country Dancing …’ There it is again – preserving standards and traditions. My thesis touched on some of these arguments in earlier times. Sharp and Miss Milligan were positively modernists compared to my research into Scottish song collecting from 1760-1888, and I really want to read more before I leap into old arguments with my size three wellies on and upset everyone who knows more about the early 20th century collectors. More anon, then. Until then, I must be restrained and willing to be corrected!